This project was complicated by its location in the downtown area of Logansport. 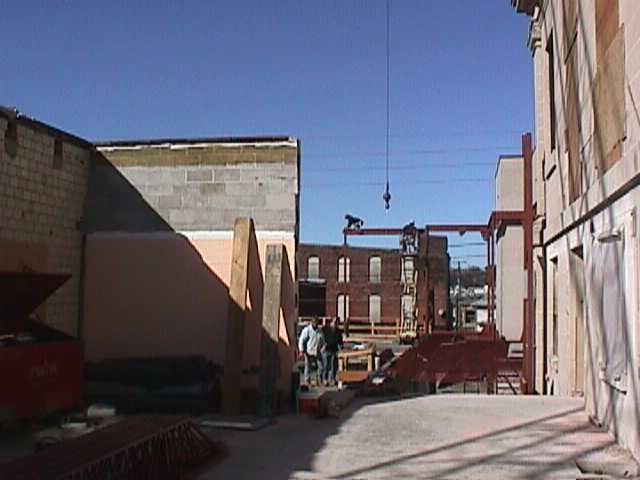 The library owned the adjacent property which already had a first floor level before the project started. 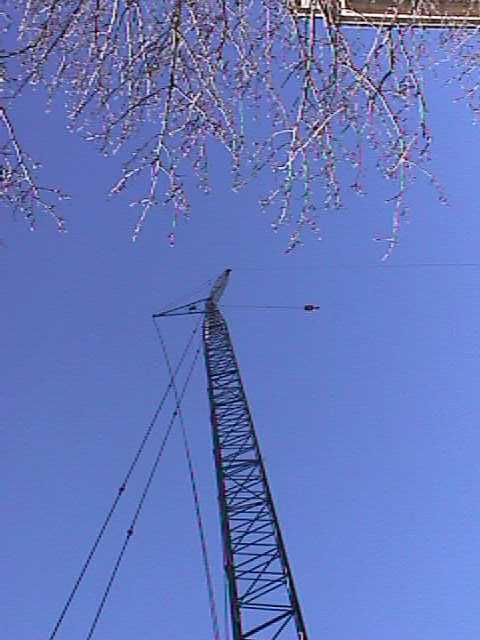 This portion had apparently stood idle for several years. 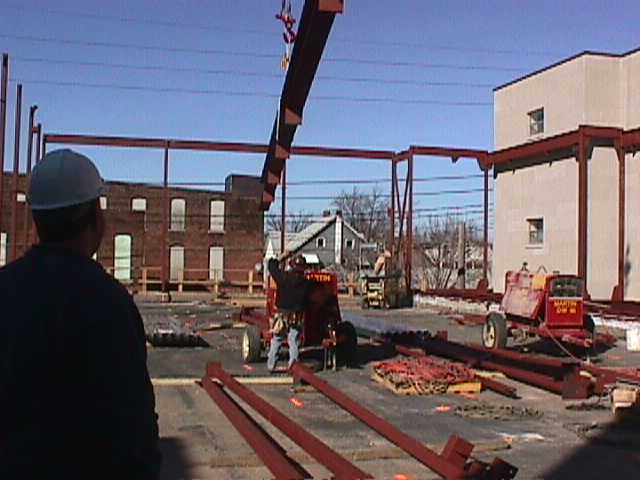 The project required shoring up any problems in the adjacent property and then building an additional two stories on top of that. 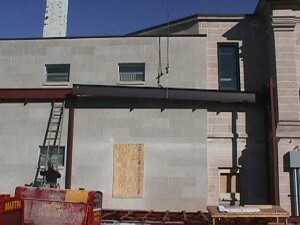 It also involved tying the two buildings together, utilizing the existing library wall. 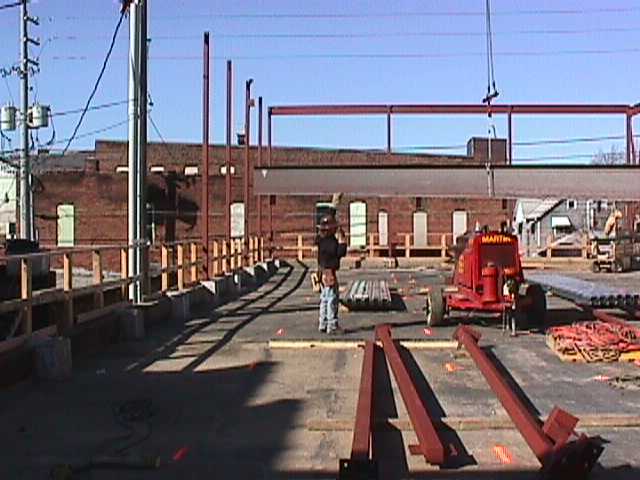 KRM Architects did as much forensic work as possible on the existing structure prior to the start of the project, but additional exploration was provided by Easterday Construction in order to document the existing conditions and allow the design of the structural steel. Some things could not be seen until demolition began. 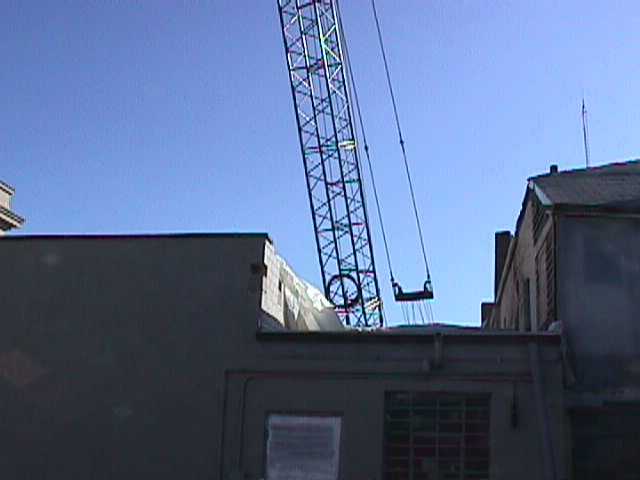 This made protecting the active portion of the existing building from the weather critical where the perimeter was breached during demolition. 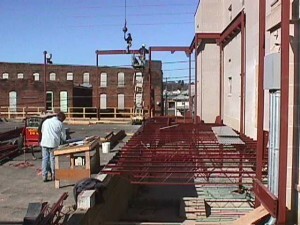 The site was extremely tight for the work required. 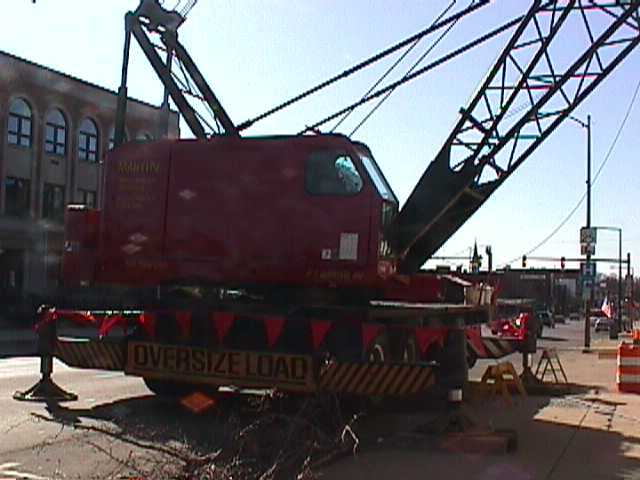 There were power lines in the alley behind the buildings, so a crane large enough to reach the back of the building had to be set up on the city street in front of the library. 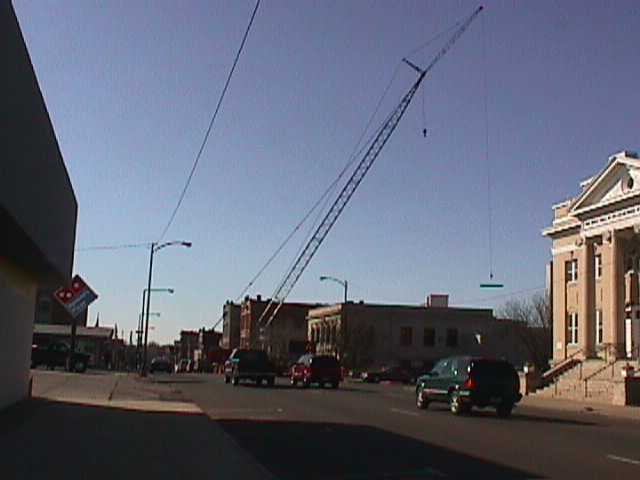 This required closing part of the street during construction and much coordination with the City and adjacent property owners. 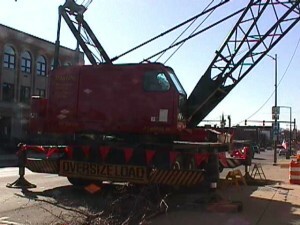 Since we were only able to work from the front, the crane had to be extremely large… large enough that they brought a small crane along to build the big one! 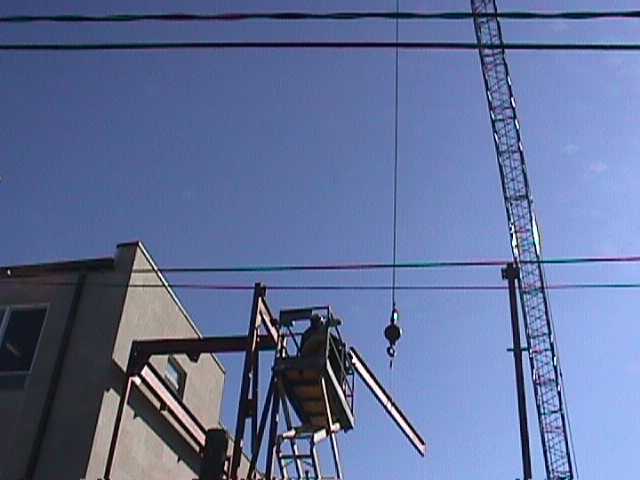 Some of the crane work and structural steel installation can be seen in the slide show above. 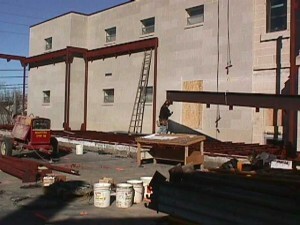 The project was completed in two phases so the library could remain in operation during construction. The access between the old building and the new building was created by a two story opening in the existing wall. 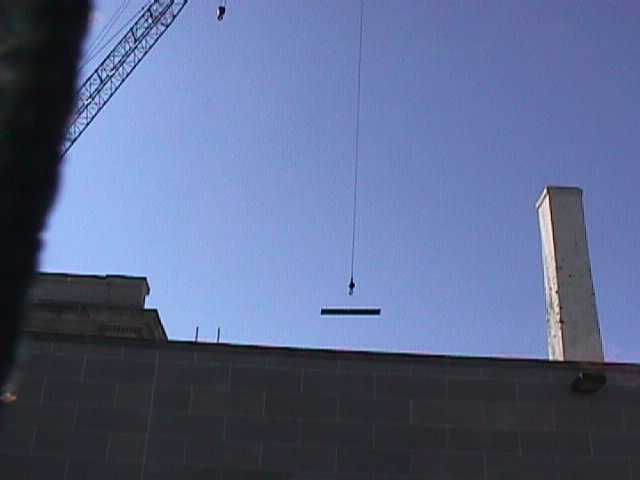 This was kept sealed during construction to mitigate noise and dust migration into the existing building. 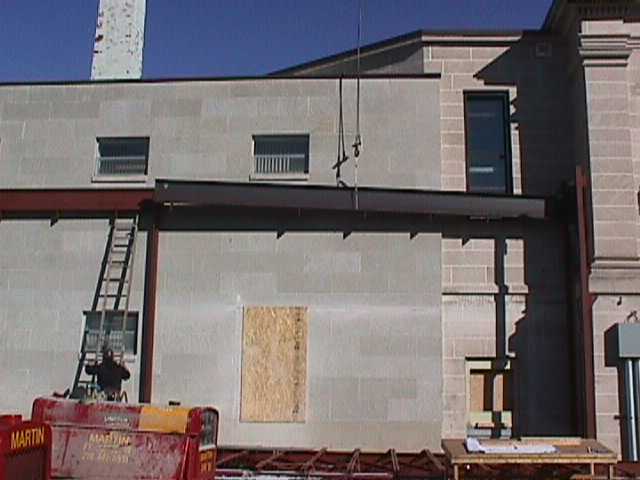 Structural steel was required to support the limestone facade above this opening. 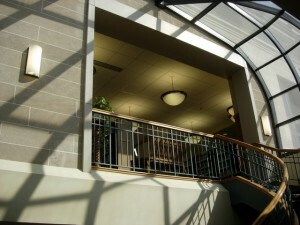 Then a curved glass skylight was installed over the area to let light into the connecting area. Once opened, there was a balcony railing looking into the new addition from the old. A sweeping curved stair was constructed for access to the second floor from the addition. This was directly under the skylight creating a focal point at the connection between the buildings. This effectively tied everything together. Assembling the railing was painstakingly slow as the rail came in thin slices that had to be bent to the curve, trimmed to fit and then glued together. 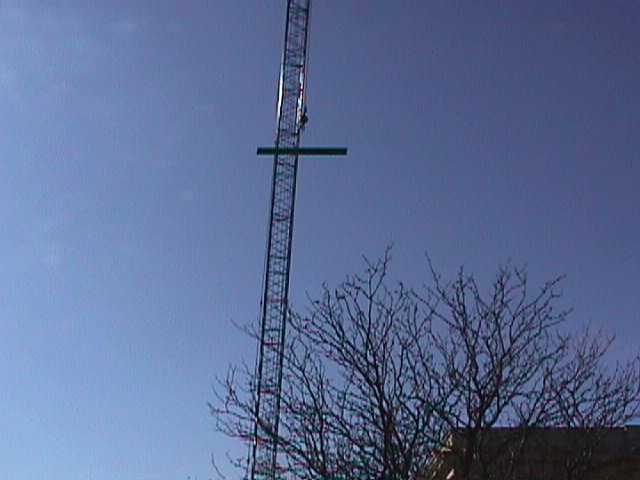 Dave Epley was our carpenter on this work. 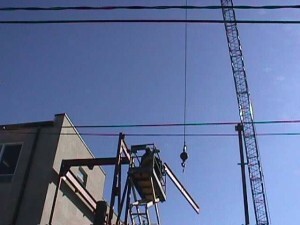 See a slide show with pictures from the stair construction here. 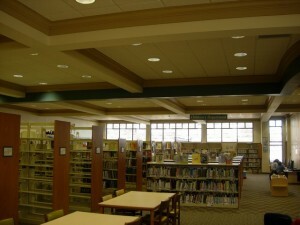 The addition had a decorative coffered ceiling over the book shelves. 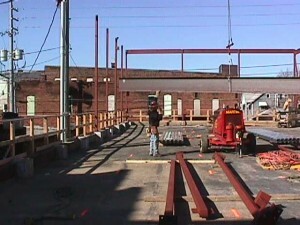 Through the used of concealed structural steel (pictured here) the ceiling was constructed without interior columns. The steel was coated with a fire supression foam before the finishes were installed. 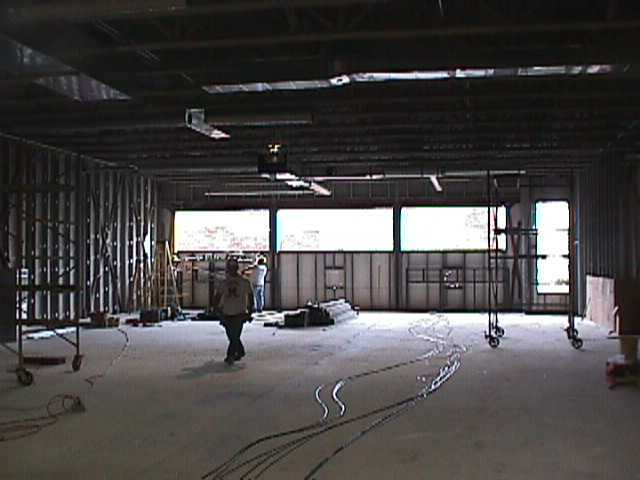 The ceiling was then finished with drywall soffits and recessed acoustical ceiling tile with can lights throughout. Clerestory windows at the back of the space let light in with a view of the sky rather than some of the less attractive elements in the back alley. 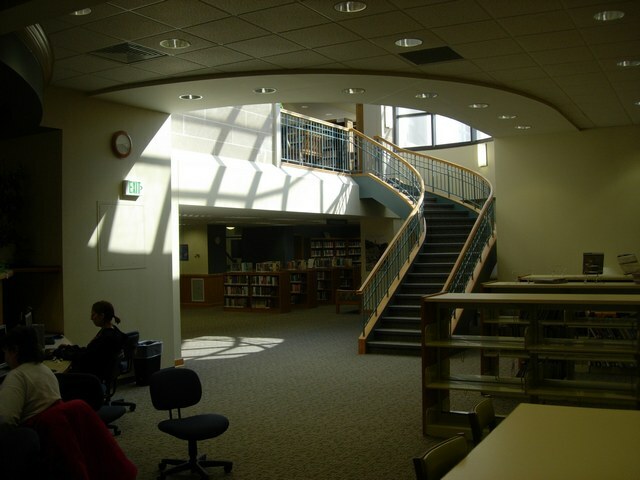 Generally the lights are left off or dim in this space during the day as enough light enters through the clerestory and the skylight over the stairs. 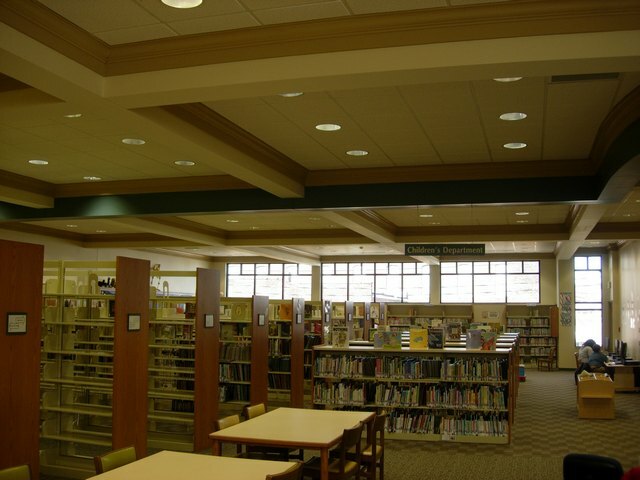 Prior to the addition, the Library was extremely pressed for usable space. Everything was very tight and there was very little opportunity to spread out and spend time in the spaces. 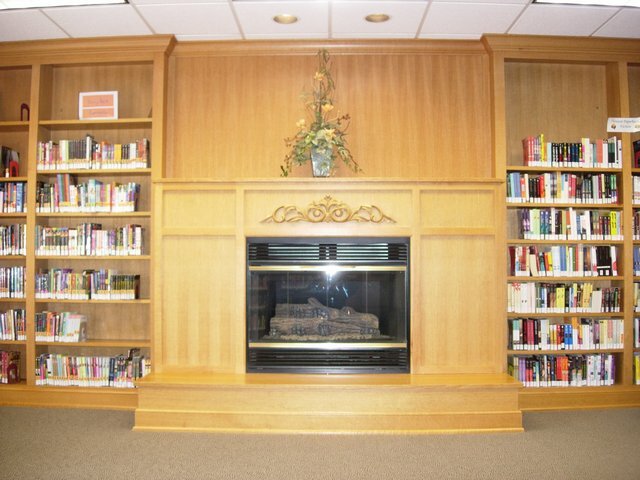 Included in the addition was a seating area with a fireplace allowing a place for patrons to relax and preview a book they might want to check out. The seating in this area is comprised of comfortable overstuffed chairs and the space is set outside the normal traffic pattern to reduce distractions. 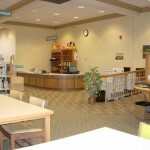 The new space also include a children’s reading section with its own circulation desk. 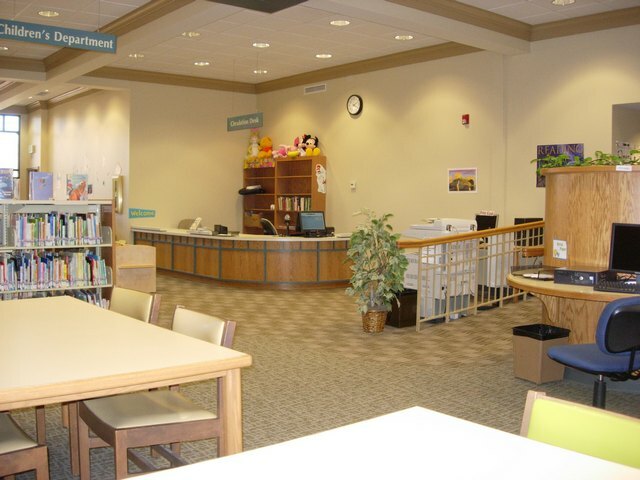 This area has its own brightly colored furniture and a gathering area for story time or other similar activities. Everything is at a smaller scale to be conducive to small children. Even the book shelves in this area are at a smaller scale. 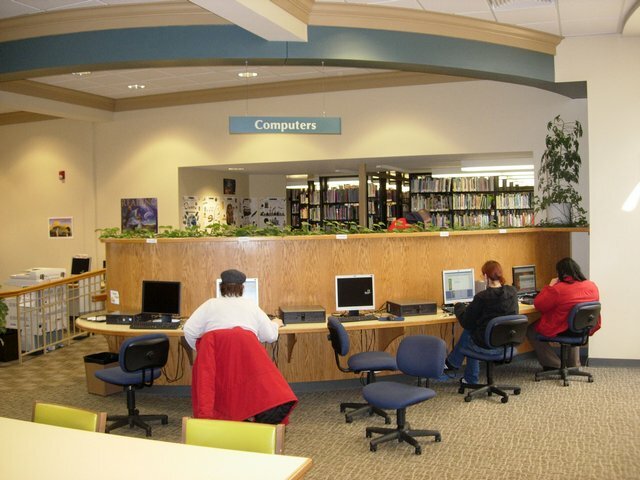 A new computer station section with divided carrels was included as well. (pictured here) It is a testament to KRM Architects’ design that the acoustics in the room are such that this space can be adjacent to the children’s area without conflict. 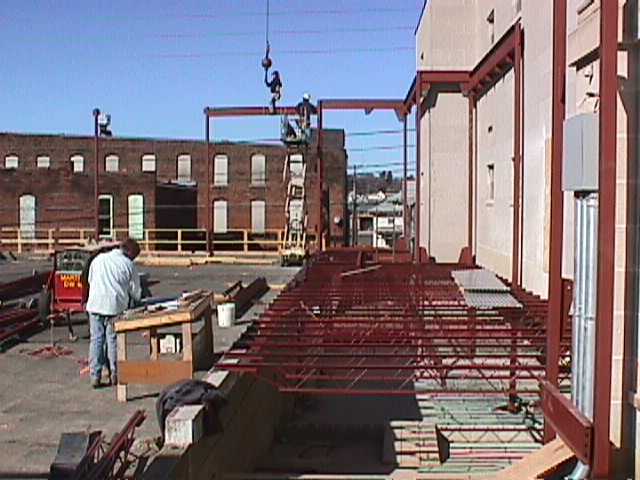 After the two story addition was completed, work to remodel the interior of the existing building began. New entrance work was also completed at this time with library patrons utilizing a temporary entrance on the side of the building until the new entrance work was finished. 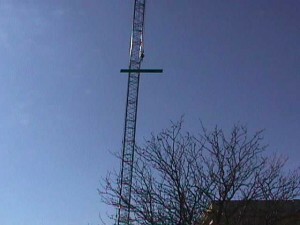 This was accomplished by removing a window on the east side of the building and framing in a temporary door. The window was nearly at ground level on the exterior, but several feet above the floor on the interior. 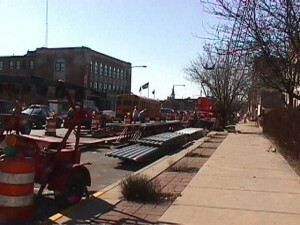 In order to maintain accessibility we constructed a temporary ramp. This took up a large portion of the circulation desk area, but the staff was extremely accommodating. The Library Director was Mr. Phil C. Shih. 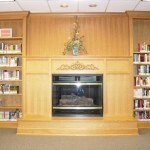 He was entrusted with managing the project for the library board. He was an extremely dedicated individual and it was a pleasure to work with him. 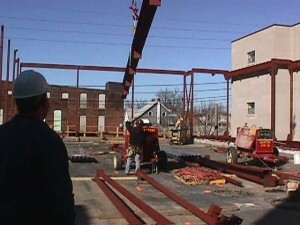 Weekly meetings were held throughout the project with excellent communications between the owner, architect, and contractor. 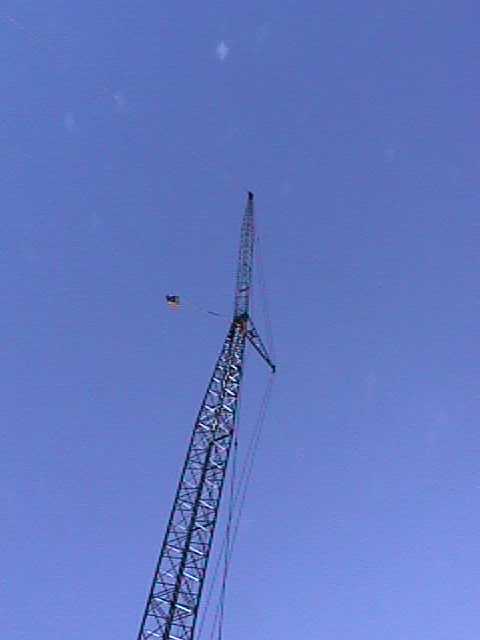 When the project was completed all concerned were proud of the finished product.